Hothouse claims from ‘Trajectories of the Earth System in the Anthropocene’ are in a virtual world, not the real world | Watts Up With That? From the “Tales of the Adjustocene” department. A recent paper Trajectories of the Earth System in the Anthropocene (Ref. below) claims that even if the CO2 emission reductions called for in the Paris Agreement are met, our Earth may still enter what they call “Hothouse Earth” conditions, a long-term stabilization at temperature 4-5 °C-higher than pre-industrial temperatures, and sea-level 10-60 m-higher than today. They conclude calling for an accelerated transition towards a CO2 emission-free-world-economy. There is, however, very little evidence that the apocalyptic prediction is scientific grounded. Where really measured, the temperatures haven’t increased dramatically, and similarly, the sea-levels haven’t risen dramatically. More importantly, any acceleration of the temperature warming, or any acceleration of the rate of rise of the sea-level, are hard to detect. Before deliberating administrative adjustments, and without other man-made biases such as UHI, changes of thermometer location, air conditioners or a car park too close to thermometer location, the measured temperatures at the start of the 1900s were scarcely lower than today’s temperatures, see Figures 1 and 2 for two examples of the many. Figure 1 –sample long-term-trend thermometer results (Alice Spring, NT, Australia). The temperatures were recorded in the Post Office / City and Airport locations. Data downloaded from www.bom.gov.au/climate/data/. Figure 2 –sample long-term-trend thermometer results (Alice Spring, NT, Australia). The temperatures were recorded in the Post Office / City and Airport locations. Data downloaded from www.bom.gov.au/climate/data/. Figures 3 to 6 then present the latest GHCN narrative after November 2011, and the prior narrative up to November 2011. A single round of administrative adjustments may change no-warming to warming. Figure 3 – Latest GHCN v3 Adjusted and homogenized for Darwin. Image reproduced modified after data.giss.nasa.gov. Figure 4 – Latest GHCN v3 Adjusted and homogenized for Alice Spring. Image reproduced modified after data.giss.nasa.gov. Figure 5 – Prior GHCN v2 raw data for Alice Spring as per November 2011. Image reproduced modified after data.giss.nasa.gov. As the temperatures of the past should not change to fit a narrative from one day to the other, it does not seem that, based on flawed data, the latest GISSTEMP global temperature reconstruction has value. Figure 6 – Prior GHCN v2 raw data for Darwin as per November 2011. Image reproduced modified after data.giss.nasa.gov. As the temperatures of the past should not change to fit a narrative from one day to the other, it does not seem that, based on flawed data, the latest GISSTEMP global temperature reconstruction has value. Regarding global temperatures, apart from subjective reconstructions, where global temperatures are not the sum of the real local parts, there is also the long term trend (LTT) inferred from satellite since 1979. This close-to-a-real measurement product, shows a warming but not an acceleration, Figure 7. The slope is larger than the average of bias-free long, term-trend temperature records, also because of the much shorter record, but the differences between linear and parabolic fittings are hard to detect. Over the 30 years of observation, across the globe, the temperature is warming more on land than on ocean, and the warming is reducing moving southwards. It is maximum about the North-Pole, and it is minimum about the South-Pole. The warming of 1 °C over 1 century and the present warming rate of 1.7 °C/century because of the CO2 emission is a speculation based on adjusted data. Figure 7 – Lower troposphere temperature results. Data downloaded from www.nsstc.uah.edu/data/msu/v6.0/tlt/uahncdc_lt_6.0.txt. The latest global 30 years warming rate is 1.25 °C/century, without any acceleration. It is not uniform, as it is maximum at the north pole, 60N-90N, 2.2 °C/century, and minimum at the south pole, 90S-60S, 0.8 °C/century. Things are even worse for sea-levels. Apart from composite tide gauge records suffering of datum-shift or changes of tide gauge location, the measured sea-levels have been rising or falling mostly following the sinking or the uplift of the land since the start of the 1900s, with an about constant thermosteric component. The satellite inferred absolute GMSL, presently rising for the thermosteric effect at a rate of 3.4 mm/yr., is a speculation based on an engineered product that does not match any measure of relative sea-level rise and absolute subsidence at the tide gauges. Figures 8 to 11 are two examples of the many. Man-made and natural subsidence is responsible for sea-level rise and acceleration. This sea-level pattern is compatible with a gentle recovery from the last LIA. The claim of sea-level rising of 60-cm-by-2050 or up-to 2-meters-by-2100 because of the CO2 emission lack of any reflection in real data. Figure 8 – sample long-term-trend tide gauge result (Fremantle, WA, Australia). In Fremantle the slope is 1.694 ±0.246 mm/yr. and the acceleration is 0.00571 ±0.01567 mm/yr². Image reproduced modified after www.sealevel.info. Figure 9 – sample long-term-trend tide gauge result (Honolulu, HI, USA). In Honolulu the slope is +1.482 ±0.212 mm/yr. and the acceleration is -0.00539±0.01450 mm/yr². Image reproduced modified after www.sealevel.info. Figure 10 – likely subsidence in the sample long-term-trend tide gauge location of Fremantle (PERT from GPS). The slope is -1.933±0.603 mm/yr² in PERT. Image reproduced modified after geodesy.unr.edu. Figure 11 – likely subsidence in the sample long-term-trend tide gauge location of Honolulu (HNLC from GPS). The slope is -0.704±0.806 mm/yr. in HNLC. Image reproduced modified after geodesy.unr.edu. The trajectories described by  are valid for the virtual-world. It is something we should not be worried about in the real-world. November 2, 2018 in Alarmism. The featured paper is based entirely on the IMAGINATION of the authors. There is no scientific basis whatever for their “projections” . They fail to note that sea levels have been higher in the past and that temperatures have been higher in the past — they instead pretend that higher sea levels and higher temperatures can only exist in their imaginary future. Kip, I am no lawyer (or even a US citizen) but can the authors of this inflammatory rubbish be sued under the dangerous speech (‘shouting ‘Fire!’ in a crowded cinema’) exclusion to the US First Amendment? They are shouting “Fire!” in a crowded planet with the intention of causing panic. earth is plausible since it has happened before and again would provide a scientific basis for their projections. Percy ==> You have to look at their Figure 1 to understand my comment. Basically they put the Earths entire Glacial-Interglacial cycle at lower temps and lower sea levels than present, which is not true, and spin the “future” out into “higher temps” and “higher sea levels”. than at present. It also shows 4 epochs in the past that were higher and 3 of which had higher sea levels than at present (indicated by b,c and d on the curve in Fig. 1). The key feature to be taken away from Fig 1. is not the absolute temperatures (impossible since there are no scales on the graph) but rather the topography of the different pathways. Currently prior to the industrial revolution the earth’s climate was cyclical going from ice-age to inter-glacial. The claim in the paper is the humanity has cause the earth’s climate to move to a different attractor by dramatically increasing the amount of CO2 in the atmosphere. The paper goes on to claim (based on speculation about possible feedbacks) that this new attractor will be dramatically hotter than current models suggest and that it might already be too late to stop the change in climate. My impression is that most climate scientists would disagree with this conclusion however surely anyone who is skeptical of the ability of models to accurately predict future climates should consider this a realistic possibility. Since if you don’t believe models can predict the future then you have no way of knowing whether the future will be warmer or colder than models predict. If you want to claim that the climate will be colder then you need a model of the climate to base that opinion on and you need to be able to justify it. Otherwise pure skepticism would logically imply that models could predict too little warming just as easily as they could predict too much. Percy ==> There is nothing in the paleo-record that indicates that current temperatures or sea levels are — in the view of the Fig 1 — outside of the lower left-hand square. The first observation is that we know both sea levels and temperatures have been far higher than now and these are not represented properly in Fig 1, which confines all but a itty-bitty bit inside the lower-left box. In their Fig 1, sea level is shown to never, until present, to have left the left-hand box. The paper seems to ignore altogether the paleo-record of past, much higher CO2 levels — the paleo-record would seem to invalidate the idea that present rising CO2 levels will spin the Earth out of its long-term observed climate cycle. “Attractors” are a concept from Chaos Theory — which I have written about here rather often. There is no reason to believe that the planetary climate will shift to some other “attractor” that has not shown up in the millennia of the past. There is some honest concern that the climate might shift to the other known climate “attractor” — a Glacial Period. To postulate that the climate system will shift to some as-yet-never-seen “attractor” is allowable — as long as it is clearly labeled as pure imagination — but it is not supported by any evidence whatever — and no evidence, other than rank speculation, is given in the paper under discussion. I put quotes around the word attractors as we are not certain that the climate system actually has chaotic attractors. The regularity of ice age/ inter-glacial through the Pleistocene shows a two state climate regime governed by the Pleistocene Milankovitch and continental arrangements. There is no rational scientific justification for postulating a third regime such as the so called hot house earth caused by minor increases in atmospheric CO2. The Stefan Boltzmann law requires humongous additional forcing to drive temperatures to the extremes as proposed for a hot house earth. While there is some evidence for a warmer earth for periods in the very distant past when the earth was fundamentally and profoundly different, that fact alone does not make a hot house regime in the near future plausible. CO2 increases can provide the necessary forcing. 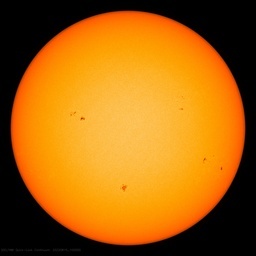 There is an energy imbalance at the top of the atmosphere of about 0.9 W/m^2. Which is not much but over time it can add up and provide the required forcing. Alternatively think about a ball rolling in one of a number of adjacent potential wells. At the top of its trajectory a small force can cause it to swap from one potential well to the adjacent one and so a very small force can produce very large changes. There are only two climate regimes (wells) in the Pleistocene. There is no credible evidence for a third hot house “potential well” above our current inter glacial climate regime. You can fantasize your tipping points until the cows come home but there is zero scientific evidence for for such. The null hypothesis should be that increasingly large forcings are required to drive the global temperatures even a little bit higher than present. Think of rolling a ball up a hill where the slope increases dramatically with distance. The observed “jitter” in the temperature records is both quasi-cyclical over multiple periods and chaotic. Increasing atmospheric CO2 has a theoretical warming effect that is small to immeasurable and its effects are net beneficial. There is a small paradox in much of the historic weather data like these shown. The longest records are mostly from heavily populated regions like cities. They can be well maintained over the years, but have higher potential for human impacts like water extraction affecting tide gauges, urban heat islands and the temptation through familiarity to adjust the data. OTOH, the weather station sites least affected by the influence of humans mostly suffer from poor data quality, with symptoms such as missing data and less instrument maintenance and calibration. For temperature data, some stations have had automatic systems and so they can be the happy middle case. These isolated, automatic stations tend to show less temperature change, a neat example being Macquarie’s Island, with essentially zero warming or cooling over the last 50 years. Because city data has fewer gaps, it is used to “infill” missing data in rural stations, and when the two differ, the rural stations are adjusted to better match the city data. Thus bad data drives out good data. will there be more misisng data in Rural? Dataset 2 has a higher mean for completeness. is that the rural stations or the urban one? so you believe that longer records are all exclusively from cities? when you did this study, what definition of city or urban did you use? What was the average length of a city series? what was the average length of a rural series? you studied to determine this? c) SST, especially SST around those coasts and islands? Because properly calibrated, maintained and attended WX stations are sprinkled all over the wastelands, aren’t they mosh? Have you got a list of these, and can show that they dominate the WX records? No? Oh? Why is that do you think? Finally I know what a “Moshpit” is. Very interesting essay, my only complaint is most of Fig. 4 is unreadable because of the graph color choice. Aren’t Figures 3 and 4 reversed? The alarmists are quite willing to fake the data, after all the end justify the means. There are articles where the “Like” button seems inappropriate; i.e. truly ugly news or topics. There are articles where the “like” button is appropriate. Then there are articles, like the above ‘Guest essay by Albert Parker’, where a “Love” button should be available. So does GISS. And they give you an interactive plot facility as well. Thanks for the link. I’ve seen it before, pastel colors and all. There are seven links within to previous Land Ocean Temperature Index (LOTI) reports that agree with what can be found with the Internet WayBack Machine. In reality there are at least or should have been 252 LOTI reports since 1997 consisting of over 300,000 monthly entries and perhaps 20 – 30% of those have been changed. The graph in my post shows that those changes these past two decades have produced an increase in the trend from 3/4°C per century to 1°C per century over the period of 1950 to 1997. It’s a matter of fact that all those changes have been made, it’s a matter of opinion why they’ve been made and form an obvious pattern. I can accept that data should be reviewed and if necessary document and make adjustments, but I have difficulty accepting the pattern and volume that is evident. Yet another article at WUWT discovering that of he thousands of locations around the world, warming at some has been patchy, and may be affected by adjustment. And it the old cherry-picking favorites. Willis made a big splash with Darwin in 2009. Alice Springs featured on May 10, 2013, 17 June 2012, And after all that, a Bombshell from David Rose, featuring, of course, Alice Springs. So, Nick, you’re okay with the data adjustments & homogenization on these two “cherry picked” examples? Nothing to see here… move along? All the other data are to be trusted as adjusted and homogenized? Yes. But as I frequently point out, I also calculate a global average using unadjusted data. It makes virtually no difference. All these cherry-picked examples have counter-cases. NCDC have a new dataset. and built from ISTI data. for grins I took the unadjusted data and selected rural stations. using 2 criteria for rural. There was an LIA, it is getting warmer. and alternative objective definition of rural. Skeptics will object that there no such thing as a global average. Skeptics will reject the data because they have too. Skeptics will point to a few stations that warm less than the average. Thanks for that, Steven and Nick. Steven you posted some good points on today’s research. I might say compelling. Your point on Skeptics seems to circumvent more important questions (you are using some”tongue in cheek). If we can agree CO2 can increase temperature (sometimes) is this short history really important? It seems that this history is a subset of things influenced by human population growth? The prevalent paleo-climatologists argument that CO2 is ultimate determinate in climate is accepted but that conclusion is easily questioned. Grant money does influence emphasis in most areas of study. Would you agree the math that confirms the CO2 control is incomplete do to multi-variant influences which are not understood? There is a long history of glacial and inter-glacial histories (the last was 6 C. warmer with CO2 levels being lower and higher than today). All the later periods have within them cold and warm extremes longer than that three hundred years . Why is this short history of temperature more important. Logic would imply we will see more changes. Population growth is a concern? I like all those unadjusted charts from Australia. All of them show the same temperature profile as the Hansen 1999 US temperature chart i.e., the 1930’s shows to be as warm or warmer than subsequent years. The US surface temperature chart is much more representative of the true temperature profile of the Earth than are the bogus, bastardized Hockey Stick charts. 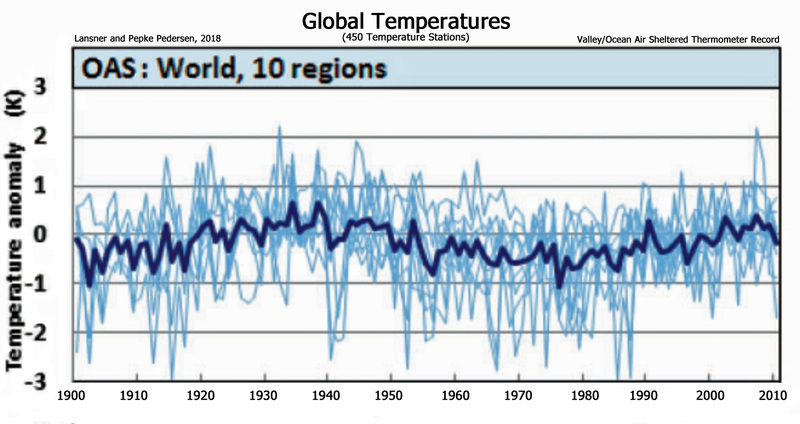 (Hockey Stick charts in this context means those charts which do not show the 1930’s as as warm or warmer than subsequent years). The Hansen 1999 US surface temperature charts is similar to unmodified temperature charts from around the world and in both hemispheres. Hockey Stick charts look nothing like unmodified charts. The temperature profile is completely different. They are a figment of fevered imaginations. That sentence encapsulates the fraud that is Climate Change pseudo-science. a good portion (last half) of the pause and extend out to recent years. on which start and end years are chosen. The World was once thought to be supported by elephants riding on the back of a turtle but satellite imagery and direct observation from the Moon has falsified that charmingly vivid model. A fancy illustration of a ‘stability landscape’ in the paper (Fig. 2) doesn’t appear to be based on an equation or any justification for the topography of the ‘landscape’. Figure 10 – likely subsidence in the sample long-term-trend tide gauge location of Fremantle (PERT from GPS). Err, no. if sea level is falling land is rising, not subsidence. The satellite inferred absolute GMSL, presently rising for the thermosteric effect at a rate of 3.4 mm/yr. No, that is not all thermal, there is glacial ice melting and about 0.3mm/y of GAIA adjustment. Fremantle is 12 miles from Perth city centre. The entire greater Perth coastal plain region has been extracting vast amounts of ground water which has lead to subsidence. The implications on the Fremantle tide gauge is that the modest measured SLR may be largely due to subsidence not global SLR. In reality I suspect Fremantle being right on the coast is largely unaffected by ground water subsidence or at least not as much as Perth City. Figure 3 of Darwin shows the unmodified temperature profile which resembles the Hansen 1999 temperature profile, and the modified profile which looks like a Hockey Stick chart. 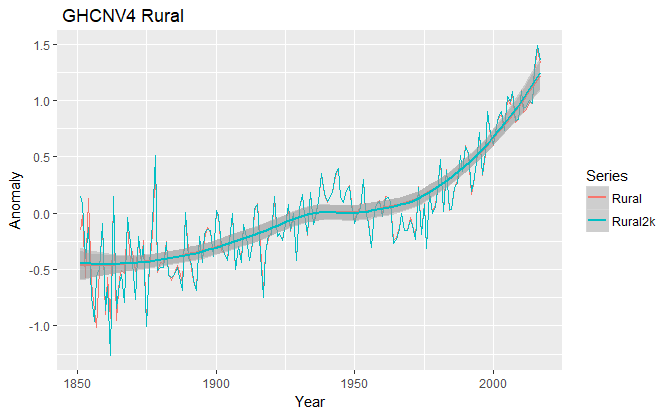 The Keepers of the Data did this modification to local temperature charts all over the world. They turned Hansen 1999 into Hockey Sticks as a means of promoting the CAGW fraud. They worked real hard to change the temperature record but they left the unmodified data which reveals the fraud they perpetrated. What do Nick and Mosher have to say about this Darwin chart? Why was it necessary to change it from a Hansen 1999 profile to a Hockey Stick profile? Why was it necessary to make this same change to charts all over the world? Why do the changes only cool the past, never warm the past?